For many years I have been busy every winter collecting snowflakes and preserving them on microscope slides using the Schaeffer replication method as detailed in an article in February 2000 Micscape. We have all heard the saying "no two snowflakes are alike" so there is an endless variety to collect and examine. I soon became aware of the many intricacies of each flake and found that by highlighting them with various colored lights, one could see internal details difficult to see with only white light (white on white doesn't give much room for contrast). For instance, Tsusumi or capped column flakes are sometimes easier to visualize in 3D with a little color added to highlight the top, bottom, or middle part of the column. 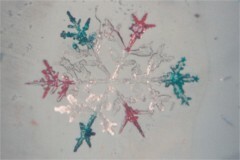 I also found that by putting a dye into the resin replicating solution, one could get gradations of color in the snowflake replica which could highlight internal details. 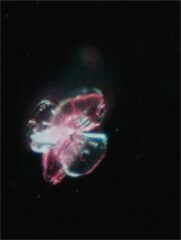 Fluorescent dyes in the resin can also give interesting results. Experimenting with the effects of color eventually lead me to try to see if I could actually "paint" the surface of the replica with a stain or ink without destroying it. 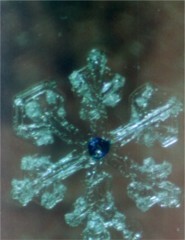 My initial attempts at painting snowflakes are detailed in an article written for The Microscope (1) several years ago. Using extreme care (the replicas are thin and very fragile) and after several botched attempts, if you keep at it, it is possible to have some success. I found that certain brands of roller ball pens available at any office supply store work quite well, provided one is very careful to touch the replica with the just the tip of the pen while viewing it under a low power stereo microscope. Stellar flakes tend to have small capillary spaces that draw up the ink (or dye) and make the process easier than one might think when a drop of ink is added to the center of the flake. 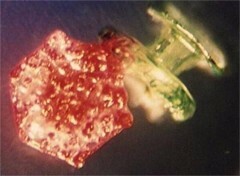 Some examples of colorized snowflakes are shown in the photomicrographs which follow. Comments to the author Comments to the author sent via our contacts page quoting page url plus : ('jbenko','')">James Benko are welcomed. 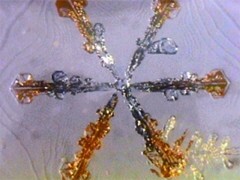 Editor's note, related Micscape articles: 'Photographing snowflakes' by Edward Kinsman. Published in the November 2000 edition of Micscape Magazine.